If you would like to skip directly to the permit process and bypass the “Rates and FAQs” sections, please scroll down to the “Technical Resources” section at the bottom of this page. The Off-Interstate application is provided in PDF format along with the OTIC Sign Program cover letter explaining the permit process. Oregon Travel Information Council sign fees are determined by highway location and traffic density (how many vehicles pass specific mile-marker locations). Our fee schedules categorize permits by sign type and location. If unclear about the cost after reviewing the files, please contact us (by email) or telephone 503-373-0086, and we will be happy to give you an estimate. Please review the two fee schedules below. Commercial Business Off-Interstate Logo Sign Rates: If you are a for-profit business, download the fee schedule PDF. Non-Profit Business Off-Interstate Logo Sign Rates: If you run a non-profit business, download the fee schedule PDF. Advance Sign: The first or primary sign installed in any given direction of travel, is known as the advance sign. This blue sign is usually ¼ mile from the intersection. It has a directional designation, (e.g. “next left”), a service designation, (e.g. gas, food, lodging, or camping), and a business logo plaque. On the billing invoice, these signs are referred to as “ADV”. Intersection Sign: The secondary business sign installed in any given direction of travel is known as the intersection sign. If a business is not visible from where motorists exit the highway, the business may need an intersection sign. This blue sign typically includes a directional arrow, a service designation, (e.g. gas, food, lodging, or camping), and a business logo plaque. When necessary, mileage is also indicated below the plaque. On the billing invoice, these signs are referred to as “INT”. The placement of advance and intersection signs is determined by an engineering highway study. Where navigation is difficult, multiple intersection signs may be necessary. If more than one business requests a sign at the same intersection, multiple plaques may be installed on the same advance or intersection signs. Off-Interstate Logo signs consist of a blue sign panel with individual business logo plaques mounted on the panel. 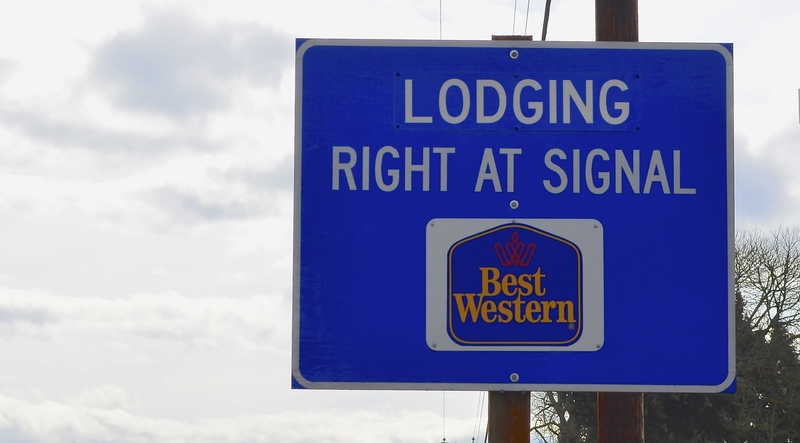 Off-Interstate logo signs have white legends for 4 different types of services: Gas, Food, Lodging, and Camping. There are two types of Off Interstate Logo signs: Advance and Intersection. The Advance signs are located about ¼ to ½ mile from the intersection or driveway where the motorist turns off the highway. The Intersection signs are located at the intersection or driveway and have arrows pointing toward the business and mileage indicators to the business. Off-Interstate Logo signs are seen as alternatives to billboard advertising by many businesses, but in fact they are classified as traffic control devices and must meet all regulations set by the Federal Highway Administration and Oregon State sign standards. If the Travel Information Council (TIC) doesn’t follow the Federal and State sign regulations, the Oregon Department of Transportation (ODOT) could lose a percentage of its Federal funding. How long does it take to get Off-Interstate Logo signs? It all depends. In addition to TIC’s criteria and roadway review process, new sign installations require an ODOT engineering review. Our goal is to turnaround sign applications within 5 days. ODOT is allowed another 40 days on the reviews after they are forwarded to them. Once approved, the timetable adjusts based on the customer’s response time to our permit and plaque manufacturing specifications. Timely receipt of the logo plaques from the customer’s plaque manufacturer also impacts the installation date. What does it cost to have Off-Interstate Logo signs? Annual permit fees are based on the average daily traffic count at the location of each Advance sign. See the For-Profit Off-Interstate Logo rates page for more information. Non-Profit and Governmental Entities are assessed annual permit fees at a reduced percentage of the For-Profit rate. See the Non-Profit Off-Interstate Logo rates page for more information. How many Off-Interstate Logo signs are allowed per intersection and how many logo plaques can be placed on those signs? A maximum of 4 Off-Interstate Logo signs may be allowed per intersection, per direction. The largest Advance and Intersection Logo signs can hold a maximum of 6 logo plaques. The same legend, ie. Gas, Food, Lodging, or Camping may not be displayed on more than two signs per intersection, per direction. Where more than 6 businesses of a specific legend are eligible for Logo plaques at the same intersection, additional Logo signs of that same legend may be displayed either by placing more than one legend on the same sign or by using a second sign of that same legend (if the additional sign can be added without exceeding the limit of 4 signs at an intersection, per direction). No more than 12 logo plaques per legend may be displayed at the same intersection, per direction. If there is no Off-Interstate Logo sign at the requested intersection, can one be installed there? An Off-Interstate Logo sign may be installed on any highway if it meets sign spacing requirements. Some cities have been determined as too congested for additional signing due to the existing on-premise and highway signs already installed. Cities labeled as “no Logo zone” areas include: Bandon, Coos Bay, Florence, Newport, Lincoln City, Seaside, Astoria, McMinnville, Dundee, Newberg and Sherwood. How many Off-Interstate Logo plaques can a facility have per direction? Businesses are limited to one Advance plaque per highway per direction. For instance, a facility cannot have Advance Off-Interstate Logo signs at two different intersections on the same highway in the same direction. Off-Interstate Logo signs are to be placed at the intersection that is in the closest proximity to the facility itself. How far away from the highway can a facility be and still qualify? A business must be located within 3 miles of the intersection of the sign request but they may apply for a distance waiver up to 15 miles. How can motorists find my facility if it is not visible at the highway intersection? Intersection signs with arrows pointing the direction to the facility and mileage indicators are placed near the intersection. Intersection signs are required when the facility is not visible. What if a motorist can see my facility, but I simply want a sign to let them know I’m up ahead? To qualify for Off-Interstate Logo signs, a facility may not be visible or recognizable to the motorist within 300 feet of the approaching intersection or driveway to the facility. If there are road conditions (brush, trees, etc.) that hinder the visibility within that 300 foot area, the business may qualify for Off-Interstate Logo signs. How are logo plaques made? Off-Interstate Logo plaques are furnished by the customer after the application process has been completed. Once the application is approved, permits, plaque manufacturing specifications and a list of approved sign manufacturers are sent to the customer. After a sign sketch is approved by both the customer and TIC, the sign manufacturer then sends the finished Logo plaques to a specified sign crew which performs the installations. What does it cost to have a logo plaque made? Logo plaque manufacturing costs are strictly between the facility and their sign manufacturer. Customers are encouraged to shop for estimates based on different grades of reflective materials. TIC provides a reference list of those companies who are experienced and have asked to be referred. Any sign company is welcome into this program as long as they are willing to utilize reflective materials and meet the plaque manufacturing specifications required by the State of Oregon. TIC recommends that customers ask their sign company for a five-year warranty in case of premature deterioration or loss of reflectivity. How much advertising can be put on a logo plaque? None. Only the facility’s Registered Business Name, or a portion of that name, is allowed by Federal and State standards. Supplemental Messages are approved word messages displayed horizontally along the bottom of the Advance and Intersection logo plaques presenting essential motorist information. Supplemental messages must be reflective, displayed in a color to contrast effectively with the background of the Logo Plaque or be separated by a divider bar. Seasonal messages may also be displayed as a Supplement Message. Approved supplemental Messages are: DIESEL, CARDLOCK ONLY, PROPANE, 24 HOUR, RV DUMP, RV PARKING, RV ACCESS, ALT FUELS BIODIESEL, CLEAN DIESEL, WIFI, CNG, EV, E85, LNG, DEF. Can a Food facility located within a Gas facility qualify for Food signing? The Food facility located within the Gas facility qualifies for Food signing if they have indoor seating for at least 20 people. If seating is not available, the Gas facility may display the Food facility on their Gas logo plaque. Fees for Gas facilities that include a Food facility on their logo plaque are 1 1/3 fee for a regular Gas logo charged in that area. This is called a Double Logo. What if the logo plaque gets damaged or the design needs changing? If TIC finds that the Off-Interstate logo plaque is deteriorating and is losing its reflectivity, the facility will be required to provide a replacement. If replacements of logo plaques occur at the customer’s request due to a desire to change the color, design or name on the plaque, a fee of $75.00 per plaque will be charged to cover the costs of removing the old plaques and installing the new plaques. Can a business purchase a facility holding logo space and retain the existing place on the Off-Interstate Logo sign? Can private clubs have logo signs? No. Only facilities open to the general public are allowed signing. OTIC Cover letter for Off-Interstate Sign Permits Read or print the letter explaining the Off-Interstate permit process in PDF format. For questions not included in the FAQ’s, please contact our friendly Oregon Travel Experience Signs Program employees or phone 1-800-574-9397. Visit our Highway Business Signs main information page for links to other highway sign permits administered by Oregon Travel Experience.